How Do We Engage In Today’s Culture War? It is hard to comprehend the cultural slide that has taken place in our country over the past decade. (Even though I will be focusing on what we are facing in the USA, I find similar battles taking place around the globe.) What may have started as a small snowball now seems like an avalanche racing toward us out of control. Most of the issues that are being played out each and every day are dividing people like never before. We even find many Christians on “opposing” sides of certain hot button matters. Everyone can easily see the animosity that has grown over the past decade in the political arena. There is also the issue of human sexuality and the gay rights movement. Of course, there are the constant arguments and attacks that are over racial issues. Just this past week I read an article about how the issue of “white privilege” is tearing apart a Christian higher education institution. Then there is the constant bombardment from all sides on the issue immigration and dreamers that is always being talked about through all the various news outlets. The artist asks the question that if we all do bleed the same, so tell me why, tell me why we’re divided. It is not my intent in this article to try and convince the readers what is the “right” side each of these divisive issues. Rather I want to suggest a strategy that Christians need to follow when trying to discern what God’s will is for them when trying to be salt and light in today’s dark world. Christians need to understand a couple of things when it comes to living the Christian life in what some people have said is a “Babylonian culture”. The first thing we must always understand is that we are at war. I know that whenever I make that statement, some people will say that I am part of the problem. However, when I say we are at war, I am not saying we are war with other people and, therefore, need to attack and defeat the “other side”. What I mean is that we are in a culture war. In Focus on the Families’ Truth Project, teacher Del Tackett, explains that we are engaged in a “cosmic battle of worldviews”. He goes on to explain that this war requires Christians to chose between believing God’s truth claims or Satan’s truth claims on any and every issue we face in life. Of course, Satan’s truth claims are actually lies. This is exactly the battle that our first parents faced that dreadful day in the Garden. Satan set forth his truth claim (lie) that they wouldn’t die if they ate the forbidden fruit but would actually become like God. Satan’s lie was in direct opposition to God’s truth claim that eating the forbidden fruit would bring death to the couple. We all know that Adam and Eve chose poorly. But just knowing we are in a cosmic battle over God’s truth claims and Satan’s lies isn’t enough to help us navigate today’s troubled seas. The most important thing we must do is to accurately identify the opposing truth claims. No matter what the issue is that we are addressing, we must be able to articulate God’s truth claim and Satan’s lie regarding it. This isn’t something that most of us can do in a couple of minutes while we rush through life. It will take a concentrated and determined effort to know the truth. I am one who needs to see something that shows the big picture in order to understand it. Some have said that I am a “model” person. I need a model to look at that helps me address various challenges and opportunities I face in everyday life. I would like to suggest that Christians need to make a list of various issues that are dividing us today. Then on the left side of the each item write out God’s truth claim related to the issue. Of course, to do this we must know what God’s Word actually says about the issue. After doing this, we need to write down on the right side of the issue Satan’s lie that he wants us to believe about the matter. As one goes through this exercise, he/she must understand that Scripture makes it clear that truth sets people free. This, in turn, means that lies enslave us. Once we have identified the two opposing truth claims, we must decide which one we are going to accept — knowing that our choice will either free or enslave us. Here is an example of a worksheet showing some of the issues that are dividing people today. 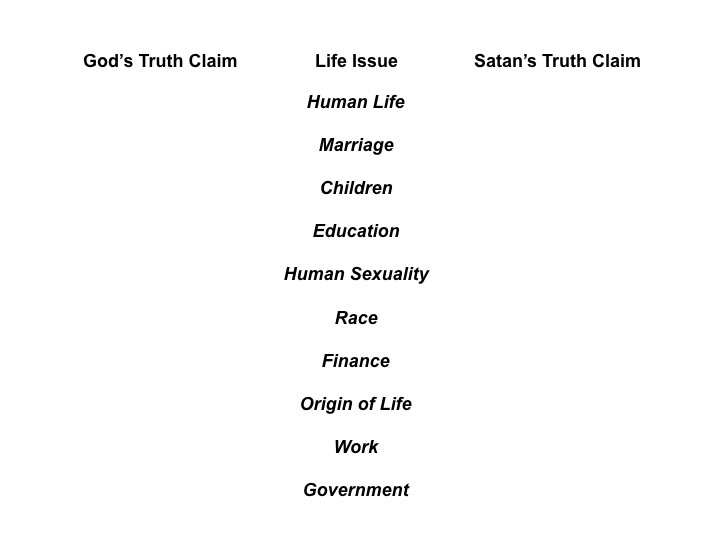 It is important that we clearly identify God’s truth and Satan’s lie about every issue of life. This must also be a major aspect of the education we give our children and youth. If we don’t teach them what God says about every aspect of life, they will only choose a side that makes them feel good and accepted by the culture. Knowing what God’s Word says and what the enemy wants us to believe is the key to whether we walk in freedom or become enslaved to ways of this world. I don’t know about you but I choose freedom! This is great, Glen! Could you provide a list of Scriptures for each of the topics you listed? Thanks! Excellent as usual. Part of the challenge here is to get believers to slow down and take time to think. Trouble is that it’s hard to think reflectively when you’re racing through life in the superficial lane.